It's interesting that David would have recently made a post that came about through people expressing their interest in Historical Fiction. For the last few weeks, I've been working with a Dalhousie Library School student named Lara who is completing her summer work term here at the public library. When I asked her if she was interested in writing a post for The Reader - guess what? - she also chose to write about Historical Fiction. Historical fiction is one of my favorite genres. I really enjoy stories and characters from other times and places. (Perhaps that's why I also read a lot of science fiction and fantasy.) An author gets bonus points for presenting an authentically antiquated setting, as well as for careful treatment of racism, sexism and cultural clashes. Clever conversation and quality descriptions of exotic locales are also important ingredients. Ariana Franklin's Mistress of the Art of Death (2007) is a very well written work of historical fiction. It is also a first class page-turning murder mystery, but not in the popular sense, with a classic detective figure calling the shots and following a trail of clues until he can neatly wrap up the investigation. Franklin's protagonist is a trained doctor imported to England from Sicily in 1171 after four children are killed in medieval Cambridge. King Henry has asked for a master of the art of death, a doctor who can speak to the dead and find out who killed them. Mysterious as this all sounds, what the doctor in question really does is reason out the likely cause of death from the physical indications of violence, and try to puzzle together the pieces to find the killer. The doctor's task is made much more difficult, however, when she is a woman and must disguise her abilities and quest to avoid being labeled a witch. Franklin doesn't shy away from shocking violence; this story is not meant for those who enjoy historical fiction merely to imagine themselves in another era and location, perhaps the object of devotion of some (conveniently handsome and wealthy) member of the local upper class. 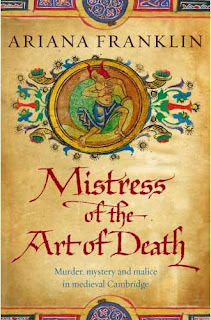 Mistress of the Art of Death is fast-paced, gritty, and mesmerizing. I got completely caught up in the human relationships that Franklin explores as well as her portrayals of cultural differences centering around faith and customs. Franklin's Mistress is a smart, courageous character I would be happy to read more about. 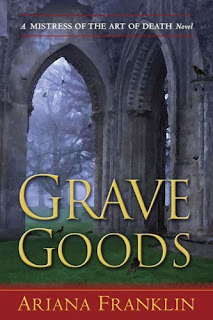 Luckily for those of us who enjoy quality period fiction, the sequel to Mistress, The Serpent's Tale (2008) is available, as well as the third in what has rapidly become a series, Grave Goods, released in March 2009. I'll be placing the former on hold and as for the latter, it is currently on order at Halifax Public Libraries. In addition to her library work, Lara blogs on a regular basis for Re:Print, a books blog at PopMatters.com, an international magazine of cultural criticism. This post is adapted from a Re:Print posting dated 18 May 2009.